There are a few parameters that are different for HEVC. 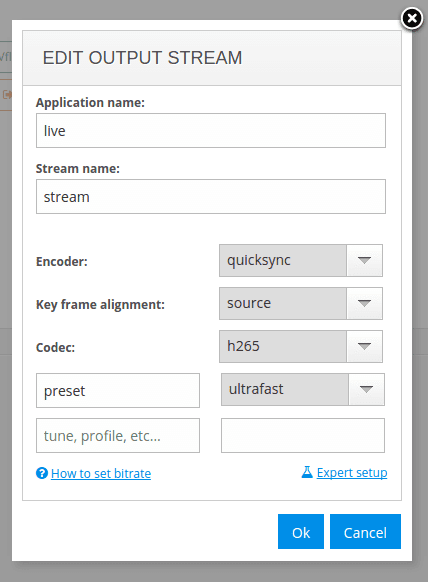 First, you need to choose "h265" in Codec field along with Encoder being set to "quicksync". Some existing parameters have different values. New parameter has also been introduced. 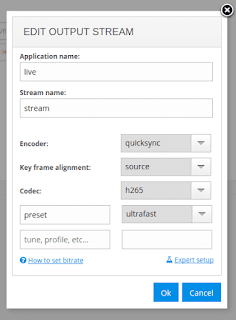 Specifies plugin for HEVC encoding. if plugin is not specified nimble loads hevce_sw if impl=sw or hevce_hw if impl=hw. hevce_sw and hevce_gacc are only available in Media Server Studio Professional. That's it. Other params are the same as for h264 codec.